How do I change the URL users are sent to after they fill out a New Item form? Customer comes to your SharePoint site. Customer sees on your landing page a list of the form(s) that apply to them. They click on a link to go to the form they need. They fill out the form and click Save. They’re automatically returned to your SharePoint site’s landing page. The first 3 steps are fairly straightforward, but step #4 is interesting. 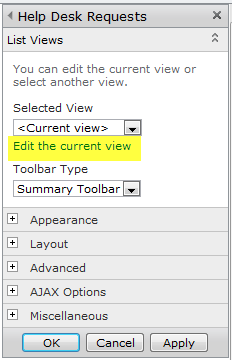 Normally, you are automatically taken to your list’s default view when you fill out and save a new item request. We want to change this default behavior. We don’t want our users to be taken to our list’s default view, because they don’t need to see all our list data. We want them to find their form, fill it out and then return to where they started. Fortunately, there’s a quick way to alter your user’s default path. By creating a custom link to your form and modifying the link’s HTML code, you can force SharePoint to take your end-users back to their starting point once they’ve finished filling out their form. 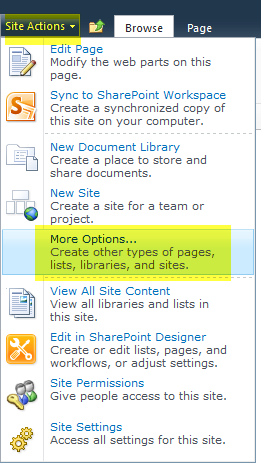 There are a variety of ways to modify your hyperlinks, including making customizations via SharePoint Designer. 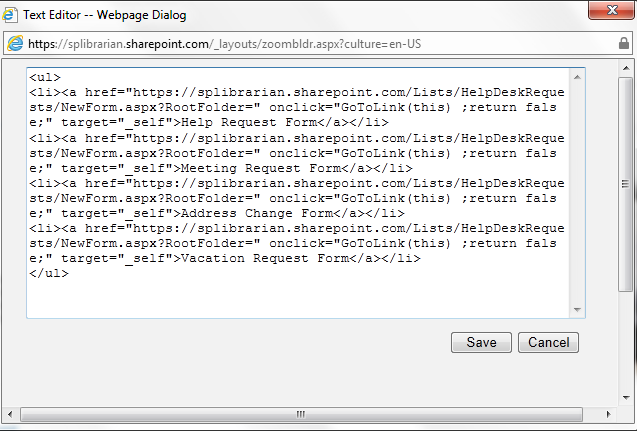 This blog post focuses on building these custom hyperlinks with out-of-the-box SharePoint web parts. Since the process differs slightly for MOSS 2007 and SharePoint 2010, I’ve included setup instructions for both platforms. Go to your site’s landing page. Click on Site Actions > Edit Page. Click on one of the Add a Web Part buttons. Right-click on the Add new item link that displays in the bottom left-hand corner of your list view web part. When the pop-up menu appears, select Copy Shortcut. Now you’re ready to delete this list view web part. Click on your web part’s edit link and select Delete. 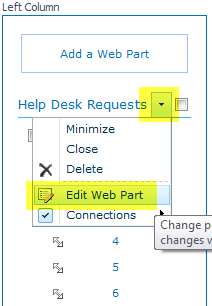 Scroll down the list of web parts until you find the Content Editor Web Part. Select this web part and click on the Add button to add it to your page. When the web part gets added to your page, it will appear with an open the tool pane hyperlink. 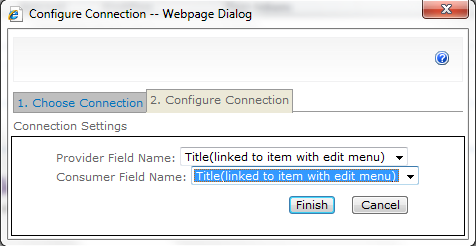 Click on the hyperlink to configure this new web part. 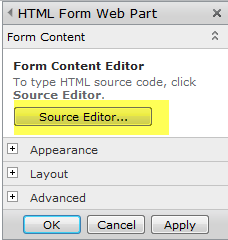 When the web part pane appears, click on the Source Editor… button. 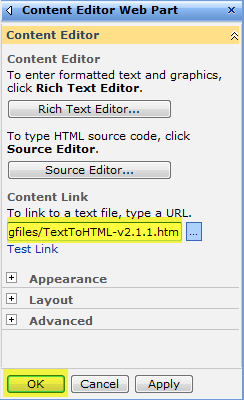 When the text entry box appears, key in the HTML code shown below. Replace the text highlighted in yellow with the URL for your new item form. Replace the text highlighted in blue with the verbiage you want displayed as your link. Leave the text highlighted in pink–this is the magic code that will make your hyperlink return users back to your site’s landing page after they submit their form. That’s it! Your first HTML link is ready to go. Test it out and validate that it is working as desired. Note that I added some additional HTML tagging around my links–just enough to create a bulleted list for my form links. You can add in as much (or as little) HTML tagging as you want. Go to the list you want to create a custom hyperlink for. Right-click on the Add new item hyperlink that appears at the bottom of the list view page. When the pop-up menu appears, select Copy Shortcut. Go to the address bar and do a Ctrl+V to paste in your newly copied URL. Press Enter. You will automatically be redirected to your list’s New Item page. Copy the updated URL that appears in your address bar–this is the URL you’ll be using to create your custom hyperlink. Click on the Insert subtab. Click on the More Web Parts icon. Click on Forms, select the HTML Form Web Part and click on the Add button. 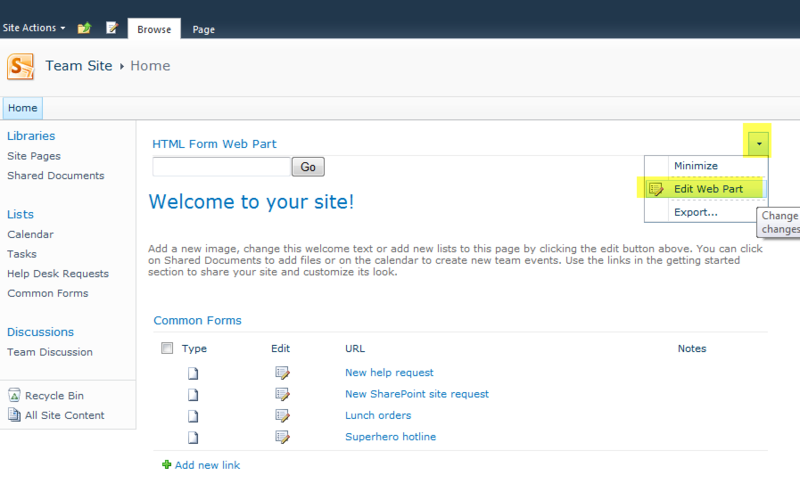 Once the new HTML Form Web Part is added to your page, click on the chevron for the web part and select Edit Web Part. Delete the text that appears in the text entry box. Key in the HTML code shown below. Replace the text highlighted in yellow with the URL for your new item form. Replace the text highlighted in purple with the verbiage you want displayed as your link. Leave the text highlighted in pink–this is the magic code that will make your hyperlink return users back to your site’s landing page after they submit their form. Build your user adoption strategy. You have to start with your basic business requirements. You need to determine what data you will be storing, how you will be storing it and when you will be surfacing it to key audiences. Since many of these questions may impact your use of color coding and conditional formatting, they’re critical to understand. You also need to know how dynamic your users want their solution to be. Do they want to be able to tweak the specific shades of green you’re using? What if they decide that they no longer want to demarcate completed items in grey–instead opting for a nice shade of puce? If you build your color coding solution using custom code or a SharePoint Designer add-on, your average business users will (most likely) not be able to make color modifications on their own. Once you have the basic business requirements down, you need to figure out what add-ons and additional features your users are dying to get their hands on. Do they get excited about having high-priority items display in red text? Do they want all the completed items in their weekly project tracker to show up in light grey font? Or are they color blind and see no value in having any color differentiation of their SharePoint data? If your users have a wish list of desired functionality that includes color coding a document library, list or calendar, you should be running (not walking!) to find any and every solution that will make their dreams come true. Delivering on your users’ wish list items will ensure smooth user adoption and easier change management. Setting up this type of color coding is fast–literally 5 minutes of work per list view you want to customize. But navigating the steps for the first time can be daunting. This blog pulls all the steps together in one easy-to-follow process. 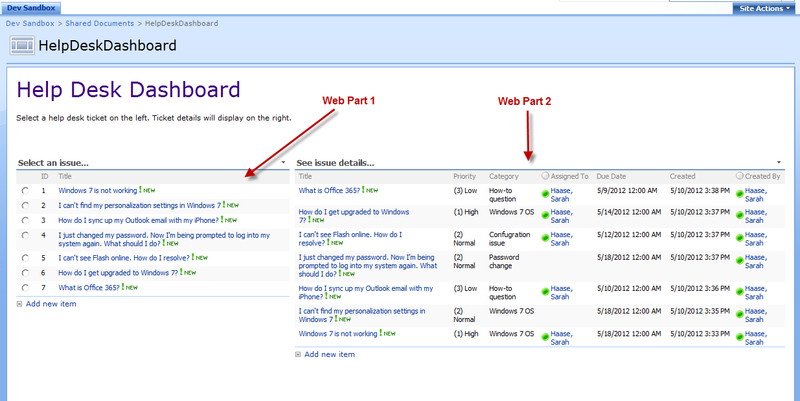 We’ll start with a business scenario, then move on to setup in both MOSS 2007 and SharePoint 2010. We’ll finish things off by discussing ways you can customize your new color coding. 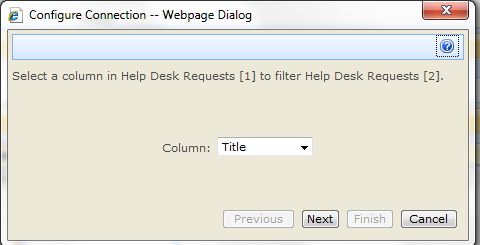 When a user fills out the New Item form and clicks OK, the help desk ticket information is automatically routed to our help desk team for resolution. 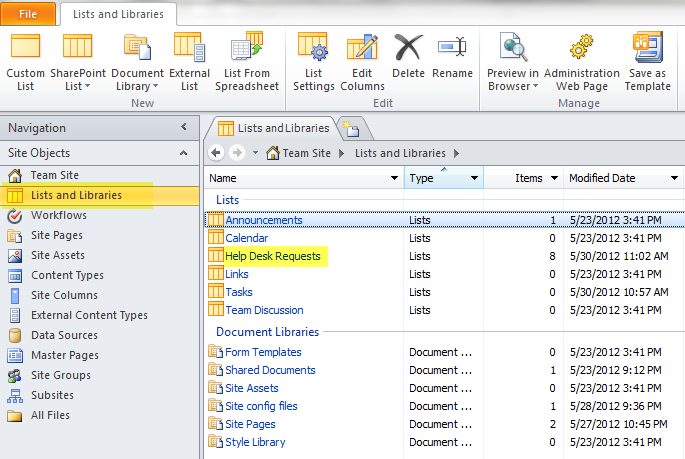 To ensure that high priority help requests are easily visible, our help desk manager wants the Priority field in our SharePoint list view to have automated color coding. He’d like all support requests that are High priority to display with a red icon. All Normal priority requests should display with a yellow icon and all Low priority requests should display with a green icon. 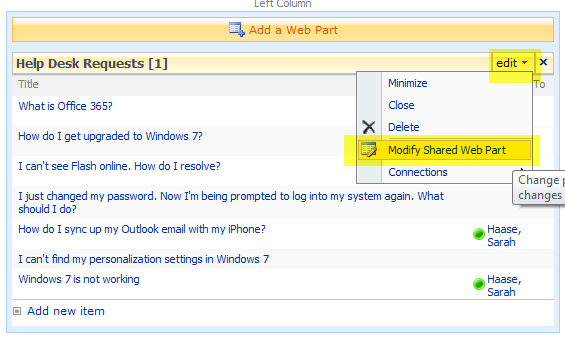 And while the team is currently using MOSS 2007, they have plans to upgrade to SharePoint 2010 in the next 3 months. So any color coding solution(s) that we build must work in both platforms. The remainder of this blog post outlines MOSS 2007 setup steps, SharePoint 2010 setup steps and cool ways to customize your new color coding. 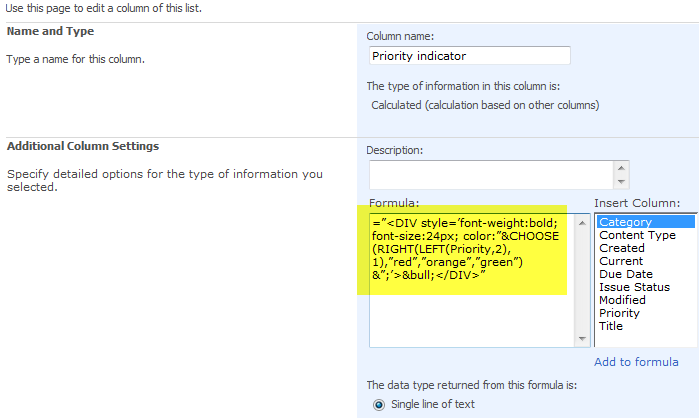 Go to http://pathtosharepoint.com/Downloads/Forms/AllItems.aspx, expand the HTML Calculated Column group header and download a copy of the TextToHTML-v2.1.1 text file. Upload the HTML script file to a document library on your site. As you can see in the screen shot below, I uploaded my file to a document library named Site config files. It doesn’t matter what document library you use to store your file, but make sure all site users have at least read-only access to the library you use. This will ensure the HTML script file can be accessed to render the color coding you’re going to set up. 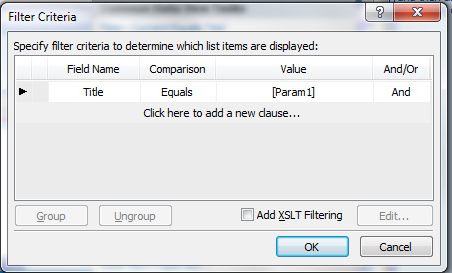 Browse the color formatting options at http://blog.pathtosharepoint.com/2008/09/01/apply-color-coding-to-your-sharepoint-lists/ and determine which option (e.g. 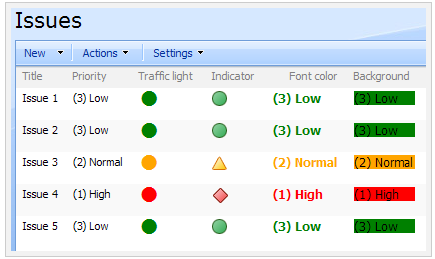 traffic light indicator, font color shading, background shading, KPI icon indicator) you’d like to implement. 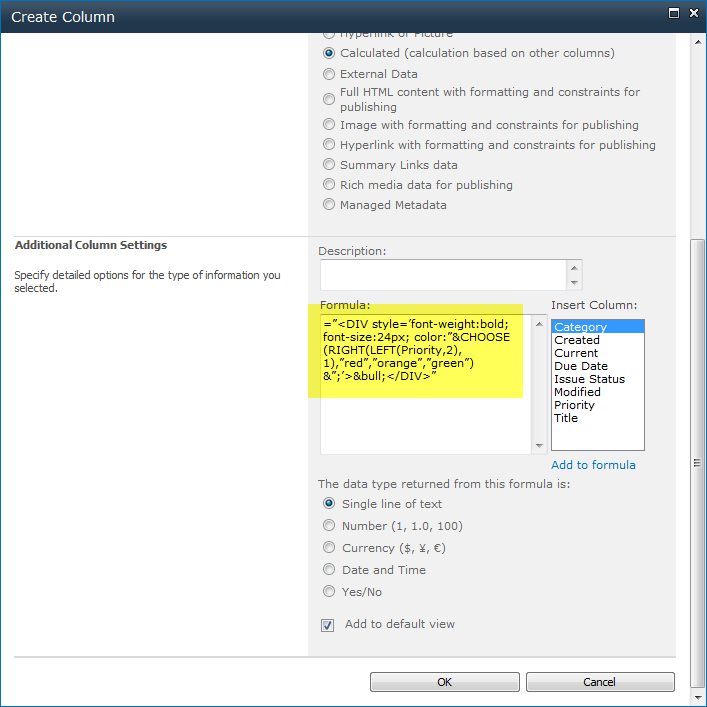 Add a new calculated column to your SharePoint list. 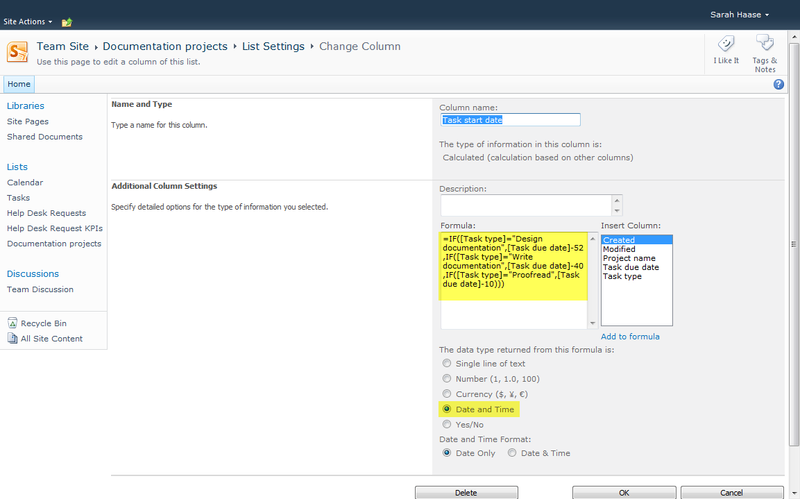 Paste the HTML formula string you copied into the new column’s Formula field. Click OK to save your changes. When you return to your list view, you’ll see your new calculated column displaying with <DIV> tags. Not very attractive. To correct this issue, we’re going to add our HTML script to the page. Click on Site Actions > Edit Page. 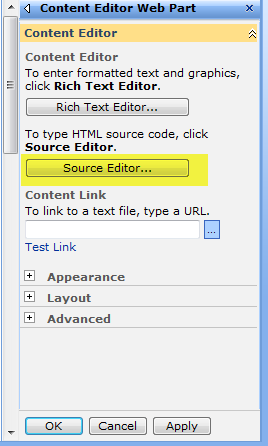 Click Add a Web Part and add a new Content Editor Web Part to your page. 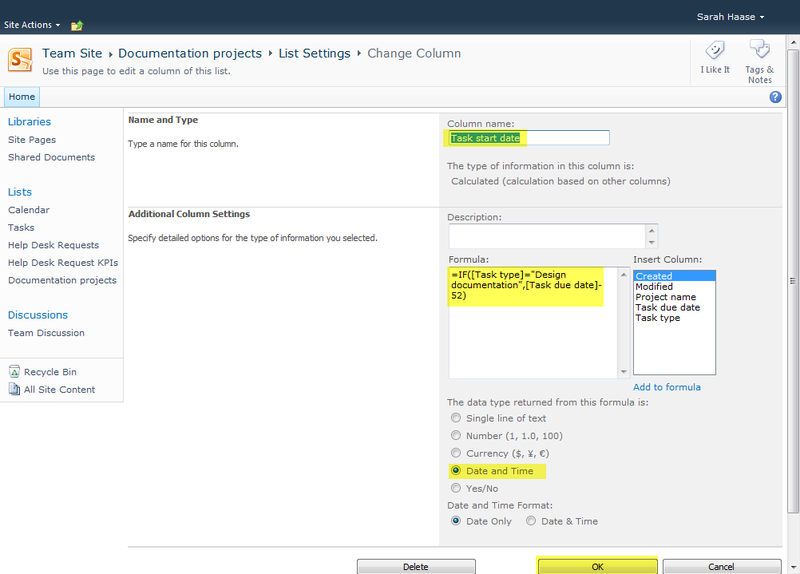 Move your new Content Editor Web Part (CEWP) to the bottom of the page. You need it to display below your list view web part. Click on the CEWP’s open the tool pane hyperlink. When the web part configuration panel appears, place your cursor in the Content Link field and enter the location where you stored your HTML script file. Click OK to save your changes. Now that you’ve set up color coding on one list view, you can continue adding more color coding to this view or add color coding to other views. Note that you will need to add one CEWP to each list view page that you want to color code. 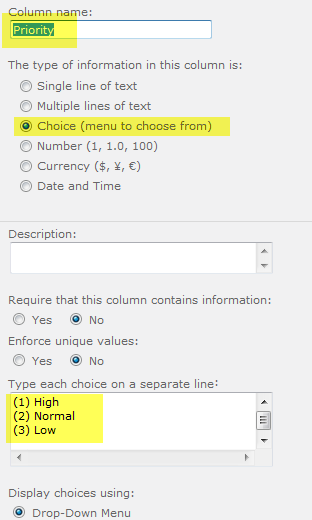 There is no limit, however, to the number of calculated columns with HTML encoding you can add to your list. To correct this issue, we’re going to need to modify this new calculated column. 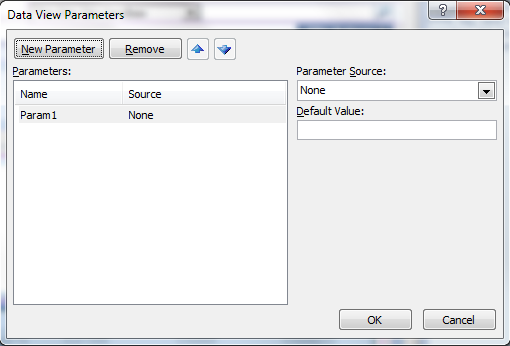 Open your site in SharePoint Designer 2010. 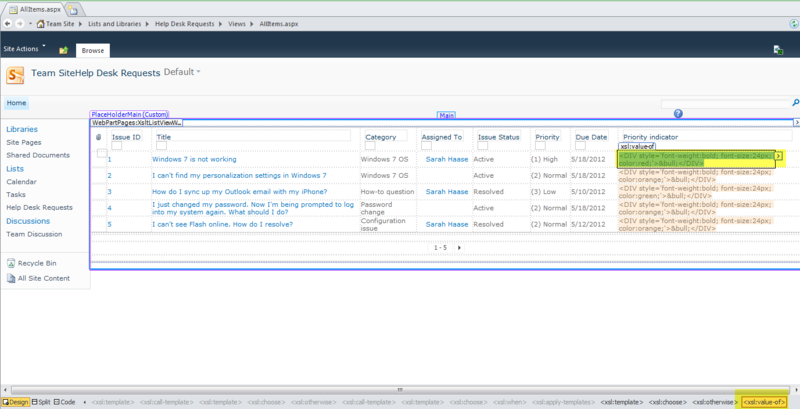 Click on Lists and Libraries in your SharePoint Designer 2010 navigation bar. When the list of your site’s document libraries and lists display, click on the list or document library we’re working on. When the list or document library details page displays, look for and click on the name of the view you’re applying color coding to. In my case, I am updating the All Issues view. tags. Notice that the <xsl:value-of> tag in the bottom right-hand corner of your screen lights up in yellow once your field is selected. Click on the Quick Tag Editor box’s green checkmark icon to save your changes. 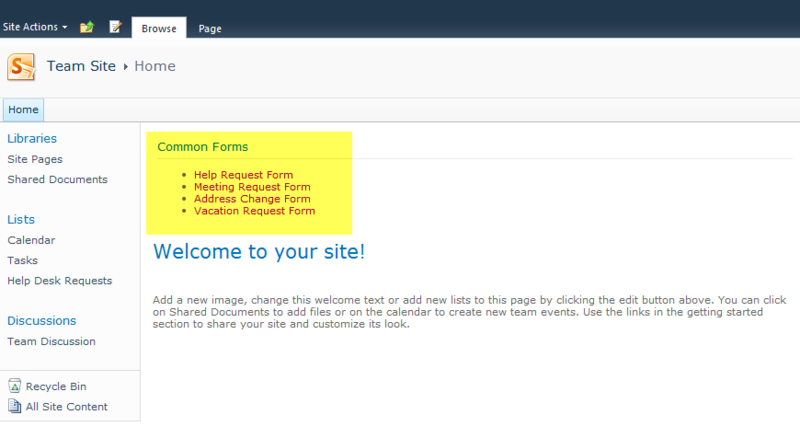 Your SharePoint Designer page will refresh and your color coding will appear! Now that you’ve set up color coding on one list view, you can continue adding more color coding to this view or add color coding to other views. 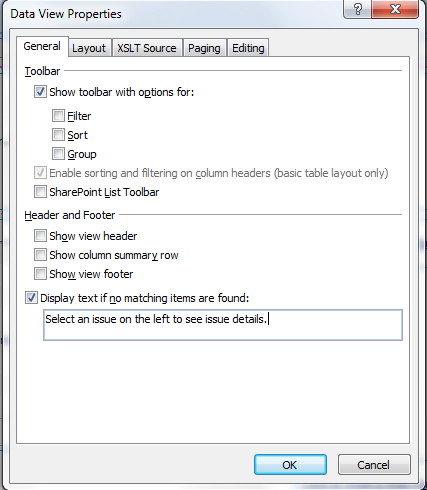 Note that you will need to modify the <xsl:value-of> tag for each column you want to display in HTML format. 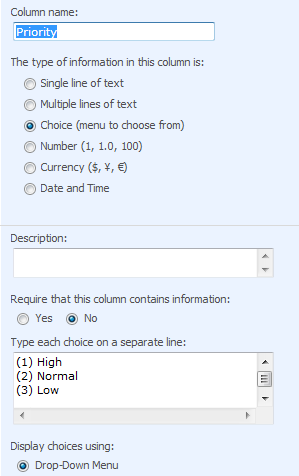 There is no limit, however, to the number of calculated columns with HTML encoding you can add to your list. Once you find a new color you’d like to use, note the color’s name. 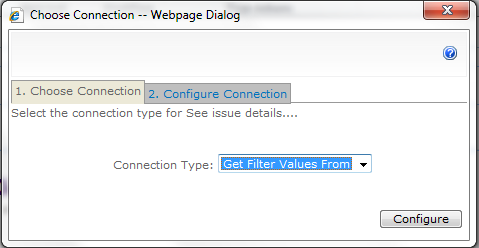 Go to your SharePoint list’s List Settings page. Find and click on your new color-coded calculated column. Look at your field’s formula and find the words red, orange and green. These are HTML color names that are currently being displayed on your SharePoint site. To modify these colors, all you need to do is replace these color names with the new color names you want to use. If, for example, you wanted to change the color orange to the HTML color Violet, all you need to do is highlight the word orange and replace it with the word violet. Then click OK to save your changes. But what if you want to make other changes–like using a different trigger field? It is quick and easy to change the name of the field you want to trigger your color coding from. Just go to your calculated column, find the word Priority and change it to the name of the field/column you want to use.